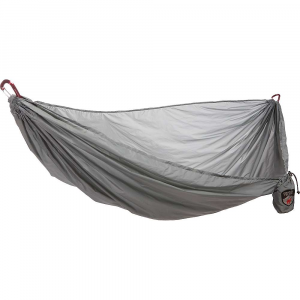 Grand Trunk's Nano-7 is an ultralight hammock that is well-made. However, this user found the dimensions too small to be of any value to me. I would recommend this hammock for those who are several inches smaller than I am or those who don't mind a “banana hang” in their hammock. Too narrow to find the "sweet spot"
I'm 6'2” tall. At the time of the review, I weighed 195lbs. I find hammocks to be the most comfortable thing to sleep in, preferring a hammock to my own bed. I would sleep in one at home, if my wife would let me hang one in our bedroom. 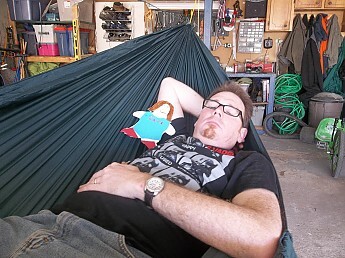 I frequently hang a hammock in the garage for Sunday afternoon naps. As I regularly encounter folks who don't know the optimal way to lie in a hammock, I thought I would start with a bit of tutorial. Most new hangers climb into a hammock and hang folded like a banana. They put their head at one end and their feet at the other, lying in a straight line. 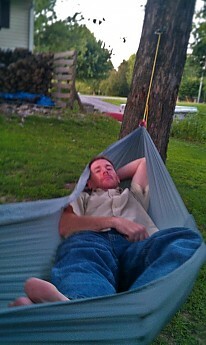 This is how I started sleeping in a hammock, and I complained about my sore back. The right way to sleep in a hammock is at a diagonal slant to the hammock. This lay flattens the hammock out, making for a comfortable night's rest. Hammock hangers call this the "Sweet Spot." During winter hiking, I have spent as much as 12 hours lying in a hammock (sleeping, reading, etc.) without any of the discomfort I find in lying in my bed too long. No, I'm not very artistic. 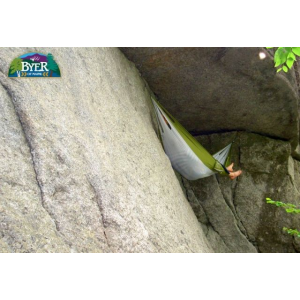 Some folk attempt to get a flatter lay by tightening the hammock so it is already hanging flat. However, this puts too much sheer force on the hammock, lines, and trees. I have read several accounts of folks ripping out an overly-tight hammock. Derek Hansen has a terrific tool to help you figure out the right angle for hanging your hammock over at his website: http://theultimatehang.com/hammock-hang-calculator. What is really surprising is that such a light hammock is rated for up to 300lbs. Many lightweight hammocks hold their ratings to only 200lbs. However, I can't imagine a larger person using this hammock, and that is my chief con to this hammock. My 6'2” frame was simply too large for this hammock. In the picture below, you can see me struggling to get a comfortable diagonal lay. My elbow and knee are fighting to keep the sides from wrapping around me. I've got a banana back going on, and I'm feeling a bit claustrophobic. If there's a sweet spot, this 6'2"
Consider this picture taken in my Grand Trunk Skeeter Beater (measures 10'6” x 5', weighs 30oz, holds 400lbs, has a bug net). I have a flat, diagonal lay. My shoulders have plenty of room. I'm not fighting off the constriction of the hammock. 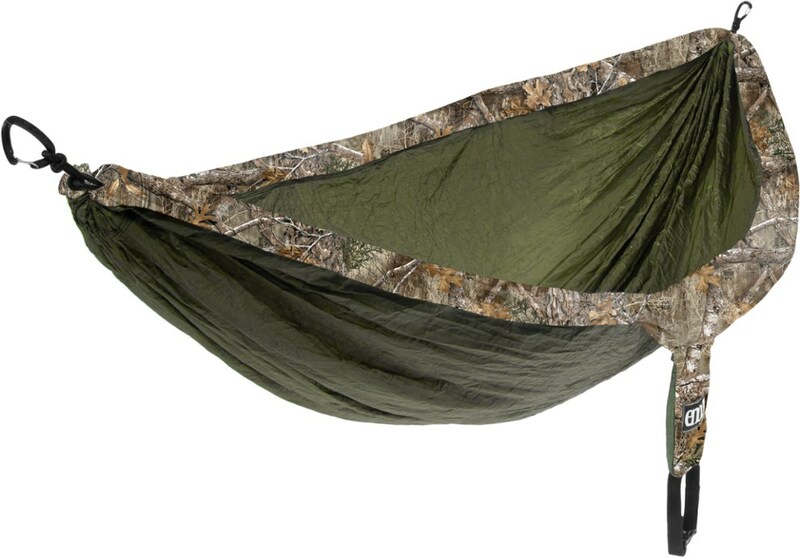 Or how about my monstrous Dream Hammock DangerBird (measures 11' x 6', weighs 29oz, has both a retractable bug net and a retractable over-cover, making it a four-season hammock). This piece of beauty simply swallows me up in the best possible way! If you are tall or wide, I don't recommend the Nano-7. It is simply not going to provide the comfort you need for a good night's sleep. However, if you are a smaller person looking to significantly cut weight on the trail, Grand Trunk may have what you are looking for here. CampSaver provided a good return policy on this product. If you are considering the Nano, I would suggest using a company with no-hassle returns. You may find it is too small for you as well. Another nice review goose! 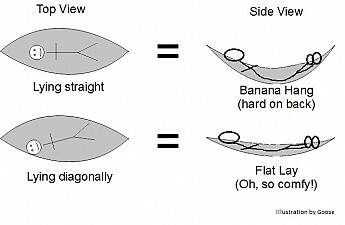 And kudos for the hammock 101, useful information. You are out of the size capacity of this hammock using general hammocking theory as I understand it. Did you always hang the hammock at the standard 30*? I have found that with my shorter and more narrow hammock hanging at a 20* angle improves their comfort. For that I really recommend not using less than 7/64ths amsteel and good trees as the more acute angle increases the forces on the suspension and the hammock itself. At 5'11" I've talked myself into and out of buying this model more than a half a dozen times. And the Simply Light Designs Streamliner swayed me for my current lightweight rig. @dirtwheels, I'm wary of decreasing the angle. 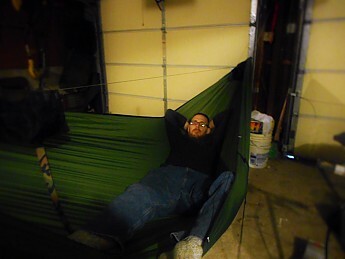 Using Hansen's hammock calculator, a 200lb guy laying in a hammock at 20* has a tension of 292lbs. That's a lot of stress on a single layer hammock. Understandable, the hammock may indeed be the weak point. Thanks for the hammock education! 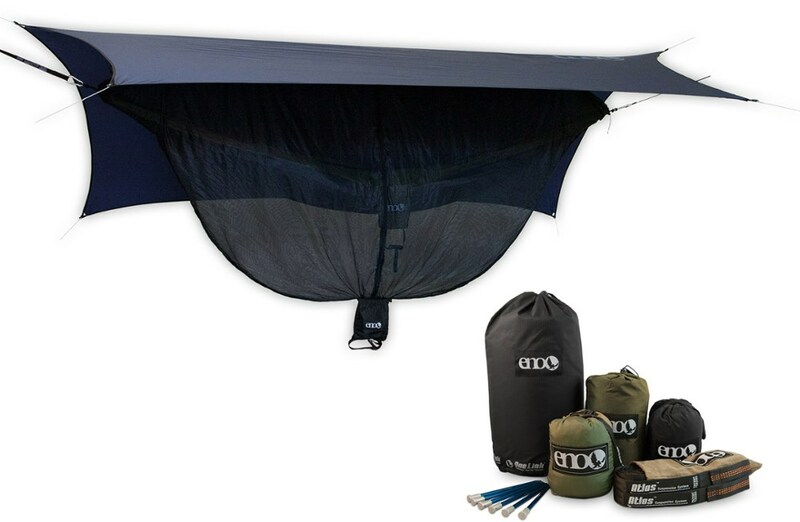 Great review Goose!...to me the point of a hammock is a comfortable night of sleep off the ground...I feel like the trend toward lighter hammocks is a bad move making them near/equally/more uncomfortable as lightweight ground systems...and yet...no where near as light...seems a lot like buying a truck with no bed? @Ashley--you're welcome! @Joseph--I completely agree, and I have a similar view on Ultralight backpacking. The goal of UL is to have a light enough pack that you enjoy hiking. So I don't get the hyperlight light ideas of sleeping on the hard ground on a piece of foam under a tarp/raincoat in order to shave a few ounces. I still have hammock camping on my list of things to try. It's nice to hear a review, especially from someone with your experience, about this lightweight option. At first it seems like a draw, but Joseph brings up a great point. Very helpful review, G00SE! I'm a novice hanger. I've heard mixed reviews about Grand Trunk, but their prices keeps me interested. Thanks for the review. Sorry it didn't work out for you. Killer review, Goose! As a fellow hanger, I'm always on the lookout for a lighter option, but I won't sacrifice all my comfort for less weight. Your review covered all the bases. My favorite part of this excellent review to which this married reader can relate: " I would sleep in one at home, if my wife would let me hang one in our bedroom." And I agree: shaving grams reaches a point of diminishing returns. @KK--my GT Skeeter Beater is a solid entry level hammock. For that matter starting with an ENO on sale isn't a bad start. Better to test a $60 hammock then commit to a $200 hammock. 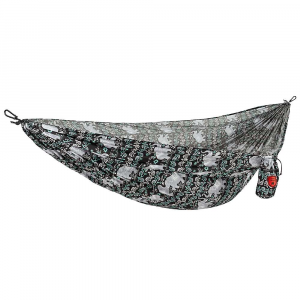 Another hammock for consideration in this ultralightweight genera is the Hummingbird Hammock single, coming in at 5.6 oz (without suspension). It is also around 9' by 4'. I bought mine with the intent of using it on day hikes and potentially as part of an emergency shelter. It is definitely not as comfortable as my Hennessy, which is sewn asymmetrically and therefore allows a diagonal lay as Goose so nicely illustrated. BUT, most complete camping hammocks weigh 1-3 lbs because of this extra material, bugnetting, and ridgeline (also demonstrated nicely by Goose). Some ways to cut weight and improve functionality are via the suspension system and tarp...but that's a whole story in itself. Nearly everything in outdoor gear is a compromise in weight, comfort, and functionality, and hammocks are no exception. By far, my most comfortable hammock is my 5 lb woven Mexican hammock, which I have slept in for weeks at a time. But I would never take it backpacking or even on a hike. So for these certain applications as noted above, these UL options may just be are a great addition to ones kit. I agree, Lah. Nothing can touch the comfort of my DangerBird, but at 3lbs, it kills any hope of being UL. In a few weeks I'm hiking the Ouachita Trail with daily climbs culminating to 7 miles per day. I've opted to leave the DangerBird at home and go with an ENO RestNest. Not quite as comfy, but it weighs in under a pound with suspension (tree straps and whoopie slings). After having the hammock for 2 1/2 years of minimal use (2 or 3 nights in back yard) + 6 nights with my son in it for backpacking (he's 8 and weighs less than 50 lbs) the hammock fabric ripped on me while I was sitting in it. With the questionable strength I'd go with a parachute nylon vs. this ripstop nylon for durability. Also the cheap $20 parachute hammocks seem better quality to me. Welcome to Trailspace, Douglas. Thanks for letting us know how your Grand Trunk hammock has worked out for you. Do you have any pictures to show how and where it ripped? This hammock, like most, requires you to buy separate tree straps in order to use it. After choosing a set of tree straps, this hammock is easy to hang. It's made of 1.7 rip-stop nylon and is very lightweight. The width is reduced to 4 feet to save weight and the length is 9 ft. The weight without tree straps is 7.4 ounces, Grand Trunk claims it's the lightest in the world. I've had many friends and kids lay and swing in this hammock. The durability of this hammock has amazed me. Everyone who has laid in it enjoys it. I would definitely recommend this hammock if weight is important. Looking for the ultimate hiking accessory? This is it. The Nano-7 hammock is light enough at just 7 oz to put in your pack to use for breaks throughout the day or after a long day of hiking. Pair it with Whoopie slings and Bliss tree straps and you have an 11 oz wonder of comfort! So go ahead and put your feet up...they'll be glad you did. This hammock is very light and great for backpackers. This hammock I have used all around, from indoors to 10' up in a tree to the Canadian back-country, and though it is better than a tent, this is not what I would buy. In the land of Canooks, I was stuck 4 hours out, by train, with my troop. Me and the other boy all had hammocks and the bug population in one square foot was more than the human population. Well we spent the night out there, and if it hadn't been for our parents, we would had not slept a wink. If I were to get a new shelter it would most likely be one of those hanging tents.